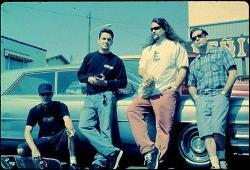 Pennywise is an American punk rock band from Hermosa Beach, California, United States, formed in 1988. The name is derived from the monster, It, from the Stephen King novel of the same title. Between their 1991 self-titled debut and 2005's The Fuse, Pennywise had released an album every two years on Epitaph Records, a label owned by Bad Religion guitarist Brett Gurewitz. To date, the band has released eleven full-length studio albums (the last being 2014's Yesterdays), one live album, two EPs and one DVD. Although their first two studio albums were critically acclaimed, Pennywise would not experience worldwide commercial success until the 1995 release of their third studio album, About Time, which peaked at number ninety-six on the Billboard 200, and number fifty-five on Australia's ARIA Charts. The band's mainstream success was signified by a growing interest in punk rock during the 1990s, along with fellow California bands NOFX, Rancid, Blink-182, Bad Religion, Green Day, The Offspring and Sublime. By 2007, the band had independently sold over 3 million records worldwide,making them one of the most successful independent punk acts of all time. Pennywise's current line-up consists of Jim Lindberg (vocals), Fletcher Dragge (guitars), Randy Bradbury (bass) and Byron McMackin (drums). They had kept their original line-up together until bassist Jason Thirsk died of a self-inflicted gunshot wound in 1996, due to issues with his alcoholism, after which Bradbury joined as his replacement. In August 2009, Lindberg decided to leave the band; he was replaced in February 2010 by Ignitesinger Zoli T�gl�s. With T�gl�s, the band recorded their tenth studio album All or Nothing, which was released on May 1, 2012. Lindberg rejoined the band later that year after T�gl�s was sidelined by a back injury.